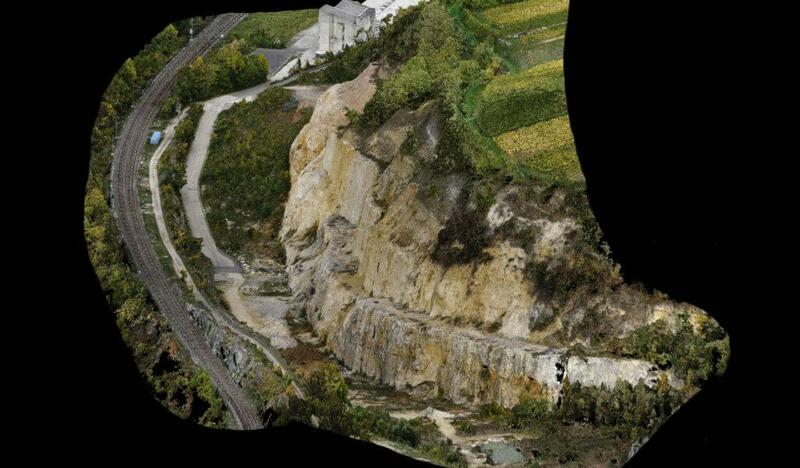 We can take on the task of the evaluation and modelling of raw 3D data based on point clouds, captured by UAV photogrammetry, UAV LiDAR scanning or through terrestrial laser scanners. We process point clouds recorded or processed by ourselves or supplied by you to draw high-precision 2D plans or to create 3D CAD models based on your specifications. 3D CAD data can be used for a wide variety of purposes, such as for the measuring of dimensions, calculations, evenness checks, collision analyses and BIM methods. 3D models are also ideal, however, for the visualisation of a project, object or site to create virtual tours, panoramas, views or 3D renderings for marketing, public relations and sales purposes. Digital terrain models, including digital elevation models (DEM), digital terrain models (DTM) and digital surface models (DSM). A measurement of buildings, surfaces or hard-to-reach areas which takes deformation into account using UAV photogrammetry or laser scanning from the air or on the ground is a highly efficient measurement method when compared with conventional measurement practices. Digital terrain model is a generic term for various types of digital elevation models (DEM), which includes the digital terrain models and digital surface models (DSM). Digital terrain models offer realistic and true-to-scale illustrations of landscapes, surfaces and objects and offer a wide range of application options. A digital surface model, or DSM for short, refers to a realistic depiction of actual conditions in which not only the surface but also elements located there, such as vegetation and buildings, are depicted. The depiction of terrain in the form of a digital terrain model (DTM) is chosen if the elevation structure is of key importance. Unnecessary elements such as vegetation and buildings are not presented. 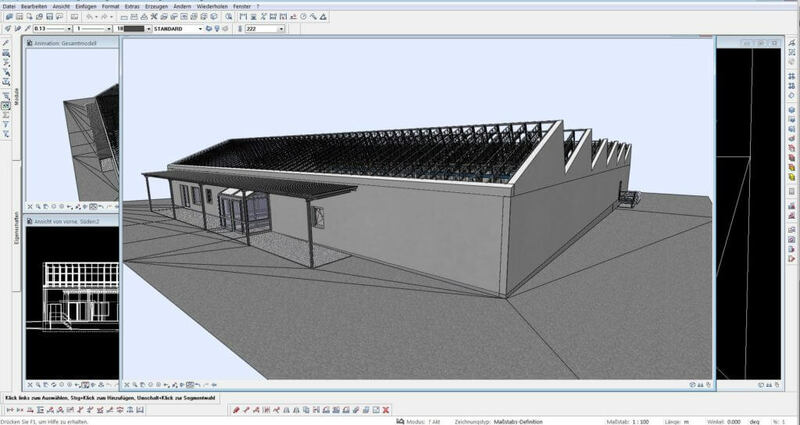 In the case of CAD modeling and 2D drawing, we use the point cloud as the basis of construction. The scanned 3D dataset gets reconstructed to create 3D CAD models, 2D plans, floor plans, sections (longitudinal and cross sections). In order to obtain a 3D mashing of a point cloud, neighbouring points are connected and a polygon mesh appears (network consisting of three of four sides). The geometric surfaces obtained are referred to as polygons or faces. Using this process, point clouds created previously by means of UAV flights can be used for volume calculation and quantity surveying. The colour-free network of polygons also forms the basis for textured surface models (3D mesh models) for visualisation. Polygons processed from the point cloud (triangular or rectangular surfaces), also referred to as faces, are textured in various resolutions by means of colour information from high-resolution images taken using UAVs, to create a realistic, colour 3D mesh model of the landscape, city or object in question. In architecture, landscape planning and the planning of infrastructure projects, UAVs and laser scanners are frequently used for capturing raw 3D data for 2D plan creation and 3D CAD modelling. For example, drones are increasingly used during building in existing structures for gathering data from the air, often in conjunction with lasers on the ground. Often complete and up-to-date diagrams, floor plans and sectional drawings are missing, which can be created highly efficiently through semi-automated or manual evaluation of the point cloud. Point clouds are also used in 3D modelling as a detailed basis for design. The point clouds are read and processed in 3D software, such as Autocad, Recab or Pointcab, to create CAD models and also BIM models according to the wishes of the customer. The customer decides exactly what should be modelled, because modelling/drawing all objects or surfaces is not necessary. The generated 3D models or drawings are handed over to the customers in the predefined standard formats. If there is a reference to a coordinate system in the measurement data, as is usually the case, this is of course taken into account and adopted in the 3D model. The virtual model can then be split between all project partners and trades, such as technical planners and architects. Furthermore, the model can be very helpful for visualising a project, or used for marketing, public relations and sales purposes (e.g. for real estate of infrastructure projects) using realistic and textured 3D models or 3D renderings. Once the individual points have been further processed into triangular or rectangular spaces by meshing (3D mesh) the point clouds, a textured surface model, 3D mesh model or 3D rendering can be created. Textured surface models refers to the virtual depiction and design of actual objects, cities and landscapes. Possible outputs are, for example, digital surface models, which also depict objects on the surface, or digital terrain models, in which the depiction of objects on the surface, particularly vegetation, is omitted. Colour information from high-resolution images taken using UAVs is textured on the pre-processed polygons (triangular or rectangular surfaces), also referred to as faces, to any desired resolution in order to enable the most realistic, true-to-life depiction of an object or a terrain. The colloquial term “digital terrain model” (correctly: “digital elevation model”, or “DEM” for short), refers to meshed 3D images, usually provided with textures (colour values), of real terrain, landscapes and buildings. A DEM is acquired when height information is recorded, processed and evaluated in a special format. Depending on the intended use of the DEM, one must distinguish between a digital terrain model (DTM) and a digital surface model (DSM). A digital surface model (DSM) is a depiction of real conditions; in other words, the illustration of the surface contains all the objects on it, such as trees and houses. If a natural topographical surface without objects or buildings is required, then a digital terrain model (DTM) is the right choice. A DTM represents the elevation structure of terrain. Consequently, objects that are not required are not collected or are removed, and the illustration is limited solely to the earth’s surface, without vegetation or buildings and suchlike. With the triangulation – also referred to as 3D meshing – process, 3D models are produced from point clouds which have already been created. To do this, three adjacently positioned points are connected together, thus forming a triangular surface, which are also referred to as polygons or faces. Depending on the desired level of accuracy or level of detail, smaller or larger triangles are formed here: the smaller the triangles, the more precise and detailed the result. In turn, a high-precision 3D mesh requires both high calculation and memory capacities. The triangulation process is an essential step in the further processing of point clouds into 3D mesh models, although there are not yet any textures or colours. In terms of surveying, meshing is the basis for volume calculation and quantity surveying, since the point cloud is joined up through this process. Once the individual points have been further processed into triangular or rectangular spaces by meshing (3D mesh) the point clouds, a textured surface model, 3D mesh model or 3D rendering can be created. Textured surface models refers to the virtual depiction and design of actual objects, cities and landscapes. Possible outputs are, for example, digital surface models, which portray all the objects on the surface. Colour information from high-resolution images taken using UAVs is textured on the pre-processed polygons (triangular or rectangular surfaces), also referred to as faces, to any desired resolution in order to enable the most realistic, true-to-life depiction of an object or a terrain.